Move over, Mythbusters: Was Archimedes an ancient STEVE JOBS? Happy 2,300th, old man... Beware of turtleneck-wearing Greeks? Happy birthday Archimedes! The Syracusan mathematician, engineer and philosopher came into the world in 287BC. We don't know the exact date of his birth 2,300 years ago, but an appreciation of the twenty-third centenary of his birth seems apt. Archimedes is most famous for four things. His utterance “Give me a [firm] place to stand and I will move the earth" (ΠΑ ΒΩ ΚΑΙ ΧΑΡΙΣΤΙΩΝΙ ΤΑΝ ΓΑΝ ΚΙΝΗΣΩ ΠΑΣΑΝ*) means he’s credited as a pioneer of the study of leverage and mechanical advantage. That expertise is the reason for his second claim to fame, namely some rather nifty weapons deployed in the siege of Syracuse - most famously a crane-type "Claw" and, according to legend, "The Death Ray", an array of mirrors (possibly polished shields) used to focus sunlight on approaching ships, apparently resulting in said ships bursting into flame. He also devised the first law of hydrostatics** during his “Eureka” moment in the bath. His screw for lifting water is also noteworthy. We'll get to all of that soon. But first, a little background. Although Archimedes' home town is on the island of Sicily, which we now think of as Italian, in his day Syracuse was Greek and had thought of itself as Greek even before Alexander the Great spread Greek culture across the eastern Mediterranean and beyond. Archimedes’ father was an astronomer and he grew up at a time Aristotle had been dead just 50 or so years. Perhaps the young Archimedes or his father knew some folks who had met the great man? By Zeus! Where can I find a decent boffin? Such meetings are purest speculation, but we are pretty sure Archimedes could access the great philosophical and scientific works of the time. Other philosophers were accessible too. Many were, by Archimedes' twenties, concentrated in Alexandria, a city which by around 260BC was one of the more stable parts of Alexander's fractured former empire. Ancient sources suggest Archimedes spent time there so he could hobnob with fellow boffins. Sadly none of those sources were his contemporaries, a common problem for historians who often have to sort the hearsay from the good bits of ancient texts. But it is known that Alexandria was a centre for scholarship and it's in no way drawing a long bow to suggest that a talented mathematician from Syracuse could have made his way across the Mediterranean to study there. The parts of Archimedes’ life we’re on the most solid ground with are his work on hydrostatics, mathematics and geometry, because he wrote books about them that survive to this day. You can see them, in a rather lovely 1897 edition, at Archive.org. One of his works, On Spirals, is considered to use techniques that are not too far short of those used in calculus, which was of course invented more than 1,500 years after Archimedes death, by Isaac Newton and Gottfried Leibniz. On Floating Bodies is Archimedes' two-part masterwork on hydrostatics, the study of fluids. 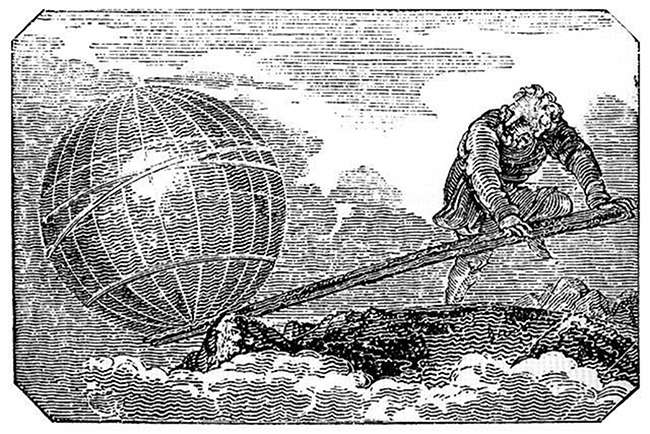 On the Equilibrium of Planes outlines theories that plainly came in handy in 212BC, when Archimedes constructed machines of war capable of lifting rather heavy objects or projecting same over large distances. Archimedes got the gig building weapons after impressing Syracuse’s King Hieron, who may have been a relative, after “on one occasion by means of a triple pulley launched with his left hand alone a merchant ship”. The source for that quote is ancient historian Diodorus Siculus, a writer of poor repute who churned out works between 60BC and 30BC. As other ancient sources include a similar tale, we’ll happily use it here. Once Syracuse became embroiled in Rome's second Punic War against Carthage (the one featuring Hannibal and the elephant trip over the Alps), Hieron pressed Archimedes into service against the Roman commander Marcellus. According to Roman biographer Plutarch's Life of Marcellus, Archimedes "...first hauled up out of the water some of the enemy's barges by means of a mechanical device, and after raising them to the walls of Syracuse, sent them hurtling down, men and all, into the sea." That device, probably a crane of some sort, saw the Romans withdraw a little, at which point “the old man made it possible for the Syracusans, one and all, to lift up stones the size of a wagon, and by hurling them one at a time to sink the barges.” Which sounds rather like a catapult of some sort, with a loading mechanism that used pulleys. It’s worth noting that catapults had been used a couple of hundred years before the siege of Syracuse, a detail that becomes important later on.